While some would argue that Woody or the other gang of main characters are the most iconic figures from the Toy Story movies, the Aliens are just as memorable. That is why when we heard the Disney & Pixar were releasing a Limited Edition 15″ Alien webcam, we were instantly intrigued. While this certainly qualifies as “kitsch”, the Alien USB webcam is a fully functional device and is not meant to just to be some conversation piece. While specifics are sketchy to say the least, what is known is that when you connect the Alien to your PC the antenna doesn’t just light up, it pulses and glows as if it was alive. When you actually activate the hidden webcam built into the mouth, not only does the three eyes glow but it also emits a squeak or chirping sound. When you disconnect, the eyes go out and once again it emits a sound; though for shutdown, it sounds more like “ooooooh”. Further helping to make this a legitimate USB peripheral is the fact that a rather large bus-powered speaker is built into the base of the body so that you can actually use the Alien as a large external speaker for your laptop. The resolution of the webcam is unknown at this time, but if it is like the 9″ Toy Story Web Camera alien, it is most likely a 1.3 mega-pixel CMOS sensor with 20cm to infinity (and beyond) focusing abilities. 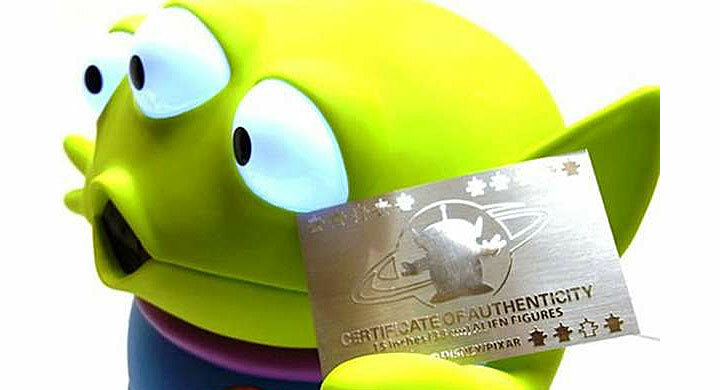 And to help prove that it is indeed a legitimate and authorized Toy Story item, this Limited Edition Alien comes with a certificate of authenticity clutched in one of its hands. No word on availability or pricing is known at this time.